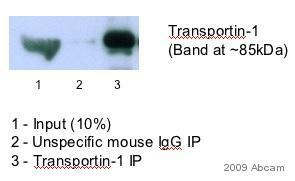 Recombinant fragment corresponding to Human Transportin 1/MIP. Heterogeneous nuclear ribonucleoprotein hnRNPA1 is an abundant nuclear protein that plays an important role in pre-mRNA processing and mRNA export from the nucleus. A1 shuttles rapidly between the nucleus and the cytoplasm, and a 38-amino acid domain, M9, serves as the bi-directional transport signal of A1. Recently, a 90-kD protein, transportin, was identified as the mediator of A1 nuclear import. Transportin mediates the nuclear import of additional hnRNP proteins, including hnRNPF. The nuclear localization of A1 is dependent on ongoing RNA polymerase II transcription. Protein A purified from tissue culture supernatant. Our Abpromise guarantee covers the use of ab10303 in the following tested applications. WB Use at an assay dependent concentration. Detects a band of approximately 93 kDa (predicted molecular weight: 107 kDa). Functions in nuclear protein import as nuclear transport receptor. Serves as receptor for nuclear localization signals (NLS) in cargo substrates. Is thought to mediate docking of the importin/substrate complex to the nuclear pore complex (NPC) through binding to nucleoporin and the complex is subsequently translocated through the pore by an energy requiring, Ran-dependent mechanism. At the nucleoplasmic side of the NPC, Ran binds to the importin, the importin/substrate complex dissociates and importin is re-exported from the nucleus to the cytoplasm where GTP hydrolysis releases Ran. The directionality of nuclear import is thought to be conferred by an asymmetric distribution of the GTP- and GDP-bound forms of Ran between the cytoplasm and nucleus (By similarity). Involved in nuclear import of M9-containing proteins. In vitro, binds directly to the M9 region of the heterogeneous nuclear ribonucleoproteins (hnRNP), A1 and A2 and mediates their nuclear import. Appears also to be involved in hnRNP A1/A2 nuclear export. Mediates the nuclear import of ribosomal proteins RPL23A, RPS7 and RPL5. Binds to a beta-like import receptor binding (BIB) domain of RPL23A. In vitro, mediates nuclear import of H2A, H2B, H3 and H4 histones, and SRP19. In case of HIV-1 infection, binds and mediates the nuclear import of HIV-1 Rev. Additional bands at: 25 kDa. We are unsure as to the identity of these extra bands. 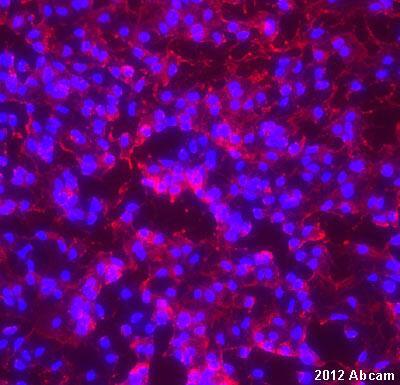 IHC image of ab10303 staining in human pancreas formalin fixed paraffin embedded tissue section, performed on a Leica BondTM system using the standard protocol F. The section was pre-treated using heat mediated antigen retrieval with sodium citrate buffer (pH6, epitope retrieval solution 1) for 20 mins. The section was then incubated with ab10303, 1µg/ml, for 15 mins at room temperature and detected using an HRP conjugated compact polymer system. DAB was used as the chromogen. The section was then counterstained with haematoxylin and mounted with DPX. Overlay histogram showing HeLa cells stained with ab10303 (red line). The cells were fixed with 80% methanol (5 min) and then permeabilized with 0.1% PBS-Tween for 20 min. 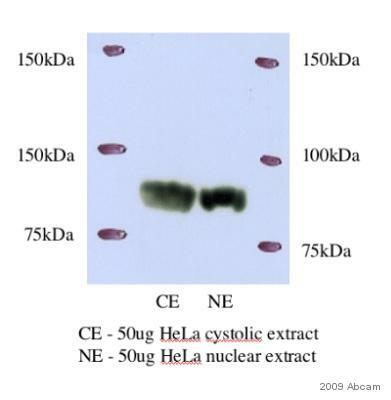 The cells were then incubated in 1x PBS / 10% normal goat serum / 0.3M glycine to block non-specific protein-protein interactions followed by the antibody (ab10303, 1µg/1x106 cells) for 30 min at 22ºC. The secondary antibody used was DyLight® 488 goat anti-mouse IgG (H+L) (ab96879) at 1/500 dilution for 30 min at 22ºC. Isotype control antibody (black line) was mouse IgG1 [ICIGG1] (ab91353, 2µg/1x106 cells) used under the same conditions. Acquisition of >5,000 events was performed. 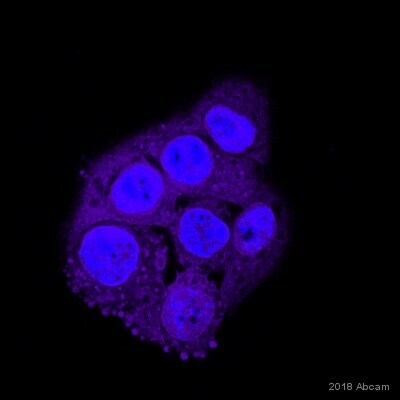 ICC/IF image of ab10303 stained HeLa cells. The cells were 4% formaldehyde fixed (10 min) and then incubated in 1%BSA / 10% normal goat serum / 0.3M glycine in 0.1% PBS-Tween for 1h to permeabilise the cells and block non-specific protein-protein interactions. The cells were then incubated with the antibody (ab10303, 5µg/ml) overnight at +4°C. The secondary antibody (green) was Alexa Fluor® 488 goat anti-mouse IgG (H+L) used at a 1/1000 dilution for 1h. Alexa Fluor® 594 WGA was used to label plasma membranes (red) at a 1/200 dilution for 1h. DAPI was used to stain the cell nuclei (blue) at a concentration of 1.43µM.